Go Beyond! It's the 25th! RECRUITMENT NEWS for the 2018/19 Scouting Year! Watch the News Page for update soon! better prepared for success in the world. For tens of thousands of children and youth across Canada, Scouts is the start of something great. For more information, visit www.scouts.ca. Scouts Canada is a non-profit organization (Charitable Registration No. 10776 1694 RR0028) and a member of the World Organization of the Scout Movement. 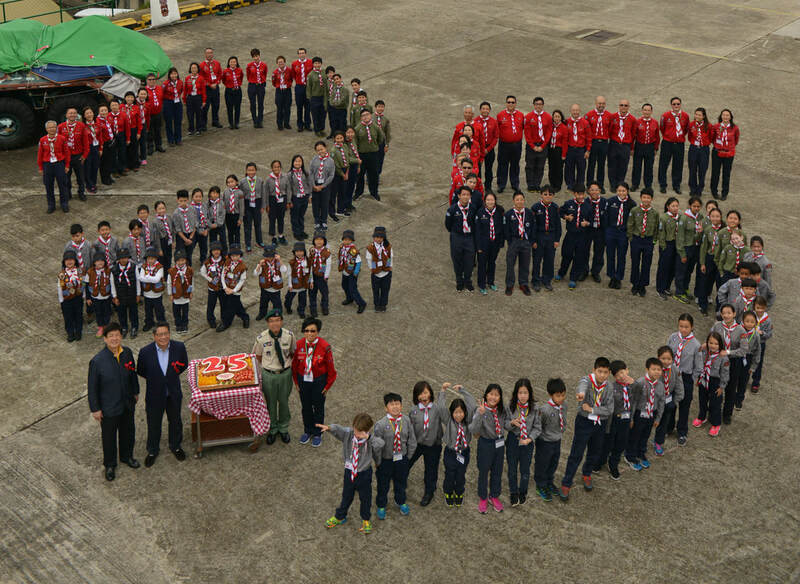 The 1st Hong Kong Canadian Scout Group (1stHKCSG) was originally founded in 1992 by the Canadian International School Parents’ Association. By then, it was the only Canadian Scout Group outside of Canada. The Group was made up of Beaver Scouts, Cub Scouts and Scouts. All Leaders of the Group were parents who volunteered. They were enthusiastic and concerned about the intellectual thinking, social and teamwork development, and the physical health of the youth. They were also committed to mentoring the Scouting members to become responsible members of the community. The presence of Canadian Scouting in the Canadian International School of Hong Kong has created a truly Canadian environment for learning, playing and Scouting. From 1999 onwards, the Canadian International School of Hong Kong has become our Sponsor since the school moved to the new permanent premises in Aberdeen. In the same year, we added a Venturer Scout Company to our Group. To date, we have about 150 members in our Group. We continue to work hard and strive to provide better physical and mental health for young people. Our aim is for them to become responsible members of the community in order to create a better world. This adheres to Scouts Canada’s direction of “Creating a Better World”! WELCOME TO SCOUTING ! Letter to our scouters! Congratulations and welcome to a whole new adventure! As one of the thousands of adults across Canada who has generously offered to volunteer your time to the Scouting Movement, you are entering an extraordinary world of learning and adventure where you’ll have a chance to guide and mentor a terrific group of young people. You are joining the largest youth organization in the world, with a membership of more than 30 million in 160 countries. Scouts Canada, the country’s leading youth organization, offers five challenging regular programs for girls and boys and young women and men aged 5 to 26 in thousands of individual groups in most cities and towns across Canada. Over 75,000 young people enjoy Scouts Canada’s programs, which are provided by close to 25,000 caring and dedicated volunteers. We have a powerful Mission, with a Vision to create a better world, and we can only do this if we work together. As a new Scouter, I trust that you will be fully committed to the role; please know there are many Scouters here to help you in whatever way we can. Our Mission : To contribute to the education of young people, through a value system based on the Scout Promise and Law, to help build a better world where people are self-fulfilled as individuals and play a constructive role in society. We want to thank you for your commitment, your time, and your energy. Without your offer of leadership, we couldn’t carry out our wonderful and dynamic programs. Taking on this role could be a bit overwhelming, so we’ve prepared a New Scouter Welcome Kit to help you find your way, answer your early questions, and introduce you to a wealth of resources you can draw on for inspiration and support. Let’s get started. NOTE: All rights reserved on photographs posted on this website. Do not copy or repost in any media.